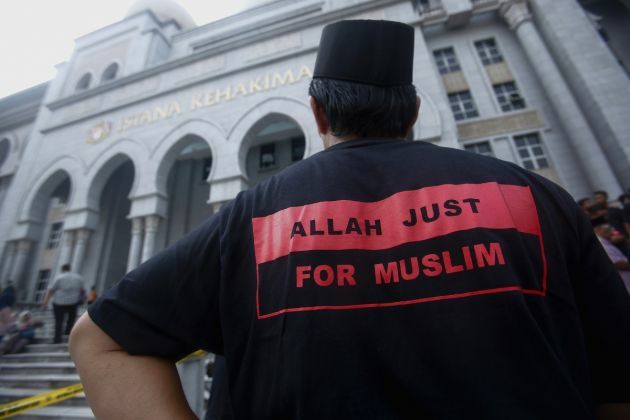 (Photo: REUTERS / Samsul Said)A Muslim man stands outside the court in Putrajaya outside Kuala Lumpur June 23, 2014. Malaysia's Federal Court on Monday rejected an application for leave by the Catholic Church to challenge a Court of Appeal decision to prohibit the weekly Herald Bahasa Malaysia section from using the word "Allah." A bishop and opposition lawmakers in Malaysia have called on the authorities to order the immediate return of the 31 Christian hymn books recently seized by the Johor police. The Catholic Church bishop of the Johor-Malacca Diocese Paul Tan demanded that Johor deputy criminal investigation department chief Assistant Commissioner of Police Dennis Lim return the seized books. They were taken from parish priest Cyril Mannayagam at a photocopy shop. Mannayagam was later taken to the police station and questioned, todayonline reported. "I protest against the intervention by the police, their interrogation of the priest with no grounds for being a threat to national security and the non-return of our hymnals," said Bishop Paul. He pointed out that Article 11, 3A of the Federal Constitution guarantees each religion in Malaysia the right to manage its own affairs. Democratic Action Party Memeber of Parliament, Teresa Kok, also pointed out on December 16 that withholding the hymn books violates a 10-point deal worked out with authorities on the controversy over Christian using the word Allah for God. Kok said Minister in the Prime Minister's Department, Idris Jala was a key negotiator of the deal, formulated in 2011 to resolve the row between Muslims and Christians over the right to use the word Allah. Kok said the hymn books were meant to be used for praise and worship by Christians and not to propagate any non-Islamic religion to Muslims. She reminded Idris that he had penned his thoughts on the 10-point deal and explained how it could coexist with existing Islamic state enactments in an article published in The Star newspaper on February 24. Quoting Idris' article, Kok noted that the minister had said the 10-point deal does not condone propagation to Muslims. But Bibles, which contain the word Allah, can be used on a conditional basis - for instance, the religious books must bear the cross sign on its front page along with the words "Christian publication." DAP parliamentary leader Lim Kit Siang also hit out at the police over seizing the 31 hymnals and detaining Father Mannayagam, the Malaysianinsder reported. He said that with less than two weeks to Christmas, it was shocking and outrageous that police detained the priest and seized the humns books. "Cyril posed no threat to national security and was not doing anything which could by any stretch of the imagination be regarded as subversive or subterfuge. "All he did was to ask a bookshop to photocopy 31 copies of a hymn book, titled 'Mari Kita Memuji Allah Kita', meant for the Orang Asli parishioners in his congregation."